"Lamb shanks are slowly simmered with fresh rosemary, garlic, tomatoes, and red wine. Great served with polenta, or my family's favorite--roasted garlic mashed potatoes--as you need something to soak up the wonderful sauce. A fantastic dish for company, as all the prep work is done at the beginning, and then you just have to wait." Sprinkle shanks with salt and pepper. Heat oil in heavy large pot or Dutch oven over medium-high heat. Working in batches, cook shanks until brown on all sides, about 8 minutes. Transfer shanks to plate. Add onions, carrots and garlic to pot and saute until golden brown, about 10 minutes. Stir in wine, tomatoes, chicken broth and beef broth. Season with rosemary and thyme. Return shanks to pot, pressing down to submerge. Bring to a boil, then reduce heat to medium-low. Cover, and simmer until meat is tender, about 2 hours. 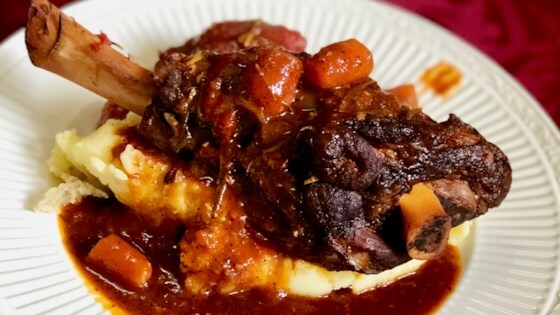 Lamb shanks are slow-simmered in a flavorful red wine sauce. This was a wonderful dinner! To those who say there was too much liquid...be patient and REDUCE the sauce. Thanks for a great recipe.